Curriculum developer Katie Gavenus (green hat at left) shows Whittier students how oiled water affects bird feathers. The Science of Oil Spills (created in 2010). The Science of Oil Spills curriculum is based on the Ocean Science and Leadership Expedition, co-sponsored by the council in 2010. 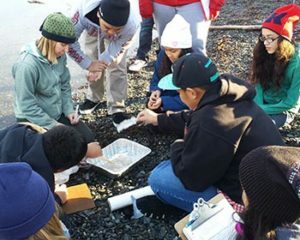 This curriculum was created by Alice Dou-Wang of the Prince William Sound Science Center.